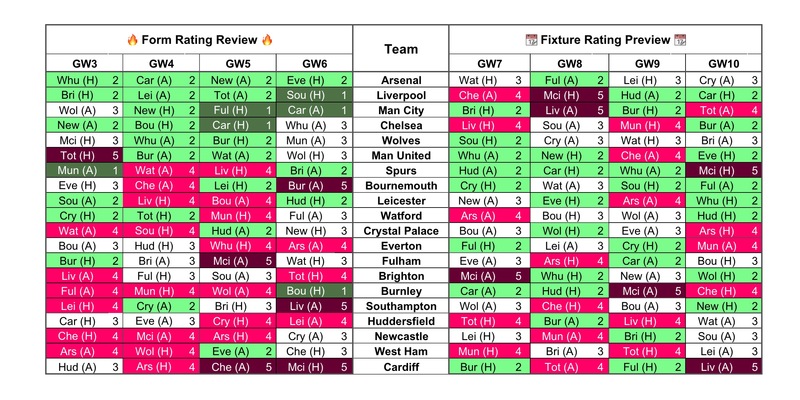 As the fixture swings shift, we analyse the Fantasy Premier League Gameweek 7 form and fixtures. Those managers holding free transfers can look for players with the perfect blend of form and fixtures for Gameweek 7. Arsenal are the front runners heading into Gameweek 7: with 4 wins in 4 games and favourable fixtures ahead. Aubameyang and Lacazette are sharing the goals, but the former should see more secure game time, plus has penalties too. In the midfield, Ramsey is starting to provide consistency, with two assists last time out. Having kept their first clean sheet of the season, full backs Bellerin and Monreal are worth considering in defence. Liverpool, Manchester City and Chelsea are all unbeaten in their last 4 games, with some solid results. However, the scene in terms of fixtures leaves plenty to be desired. Salah should justify his price tag in the big games from Gameweek 7 onwards, with excellent home form. The leagues best defence shouldn’t be overlooked, despite the fixtures, with full backs Robertson and Alexander-Arnold both capable of attacking returns. Aguero and Sterling are the form players for Manchester City, providing consistent returns: although rotation is always a big factor here. Elsewhere, Ederson looks the safest route into the City defence, off consecutive clean sheets. From Chelsea, it’s difficult to overlook Hazard and Alonso. Their output is far ahead of the rest of the Chelsea squad, with some rotation risks and lack of consistency elsewhere in the squad. Bournemouth and Manchester United have the pick of upcoming fixtures for Gameweek 7, but some patchy form plagues them here. For the Cherries, the defence is inconsistent, but attacking returns should continue for King, Wilson and Fraser. Stanislas returning to fitness could hamper Fraser’s output. Manchester United’s inability to score bumper goals in a game does limit the appeal of attacking assets. However, Lukaku and Pogba remain consistent in the points. The defence have just one clean sheet in 6, but Shaw does offer a budget entry point and some attacking threat.